Batman tries to reason with the recently corrupted Superman but to no avail. He is forced to use Kryptonite again to slow Superman down and manages to get himself and Plastic Man clear. Superman eventually uses his heat vision to melt the lead in the walls around him to cover the Kryptonite, but Batman allows the Blackrock to take over and joins Superman in his rejection of humanity. Batman takes off for Gotham leaving Superman with his cousin Supergirl, who is feeling conflicted over her recent hatred of the human race. Superman leaves and goes to confront his last tie to humanity; Lois. Lois manages to break through all of the lies that Superman came to accept and brings him back to being the hero he was meant to be. With a new resolve he flies off to save his friend just as Batman had tried to save him. 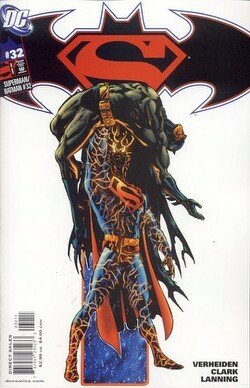 As Superman and Batman fight in Gotham City the rest of the alien heroes converge in Metropolis. They all stand there, waiting. Suddenly, a hail of rocks begins to rain down on Jimmy and Lois. One of the rocks hits Jimmy and infects him with the Blackrock. Finally the alien invaders have arrived. Story - 3: Blah, blah...this book was late...blah, blah...wow, look at the fact that the cover date is February and this book came out in March...blah, blah God I just don't freaking care anymore. There's a phrase. It's called beating a dead horse. There's no point in getting mad anymore. Anyway, I really wanted to like this issue more. I mean I liked it. It had some really solid character moments, especially between Lois and Superman, but there was such a rushed feeling to the whole endeavor and there were certain aspects of the story that just made me go, "What the huh?" The main problem seems to be that the pacing of this arc was thrown way off with this issue. Verheiden has told a story that involved a large cast of characters and focused on certain themes, such as Superman's alien nature and how he views his place in the world as the stranger in a strange land, and a lot of time was focused on the action and the bad guys and the build up to yet another fight between Superman and Batman. This issue took all of the careful timing and stuck a nitro pack into the back of it allowing the plot to go screaming forward. While sometimes the ride can be fun and exciting it was also confusing and, in the end, unsatisfying. Superman's possessed. He and Batman fight. Batman's possessed. Superman talks to Lois. Lois reasons with him. True love wins. Superman fights Batman. Aliens show up. To be continued. It just all went by too fast. Way too fast. And why the heck did Batman allow himself to be taken over by the Blackrock? I know that there is some explanation, but frankly it better be a good one because that came out of left field and made seemingly no sense. I know I shouldn't expect everything to be explained at once and frankly I don't want it to be, but hokey smokes that just left me scratching my head. Still and all I have to say that as much as I didn't care for this particular chapter the storyline as a whole has been well worth reading. There were parts of this issue that I really like, especially the scene between Lois and Superman which, while rushed like the rest of the issue, gave this story the emotional element it needed. Between that and the creepy feeling of all of the alien heroes gathering in Metropolis and gazing skyward this issue deserves the solid three I gave it. Art - 5: While the storytelling wasn't as strong as the previous issue the art in this chapter was very epic. There were enough hero (or evil hero I guess) shots of Superman to satisfy even the most passive fan. This was a pretty dense issue as far as the artwork goes, so I really have to commend Clark, Randall, Lanning and Hillsman on drawing the sheer number of characters they did and still give the cast a distinctive look. The characters may have been a bit on the scratchy side for me, but I still really enjoyed this issue from start to finish as far as the artwork is concerned. Cover Art - 4: The white negative space really drew attention to the figures of Superman and Batman making this cover eye catching, but only when you do the double take at the realization that the Man of Steel is hoisting the Dark Knight into the air. The white makes you want to keep on looking but that is the appeal of this cover to me. It engages the potential reader to really examine it and only then do you notice the detail. Overall a really neat cover that took me awhile to figure out.